11.6.1930: Launched by Smith’s Dock Co Ltd, Stockton-on-Tees (Yd.No.929) for the Iago Steam Trawler Co Ltd, London & Fleetwood as ADMIRAL SIR JOHN LAWFORD. 24.7.1930: Registered at London (LO42). 8.1930: Completed (Edward D. W. Lawford, manager). Fitted with radio telephone. 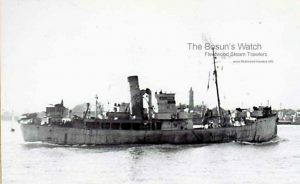 29.8.1939: Requisitioned for war service on examination service and as a minesweeper (1-12pdr) (P.No.FY.533) (Hire rate £167.11.10d/month). 1.1944: Fitted out for wreck dispersal duties (P.No. 4.415) and assigned to Operation Neptune – Normandy Landings; in readiness at Penarth. 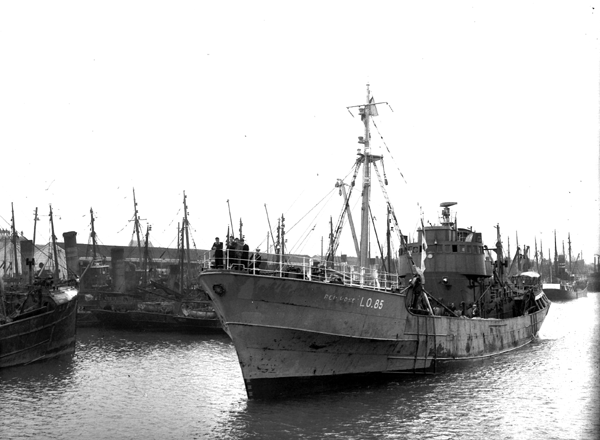 11.6.1944: Sailed Plymouth for Normandy. 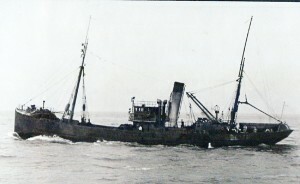 Employed on wreck dispersal and anchor recovery work. 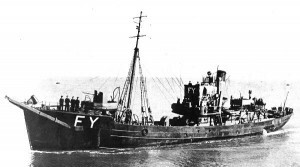 11.1946: Converted for burning oil fuel, F.P. Above 150°. 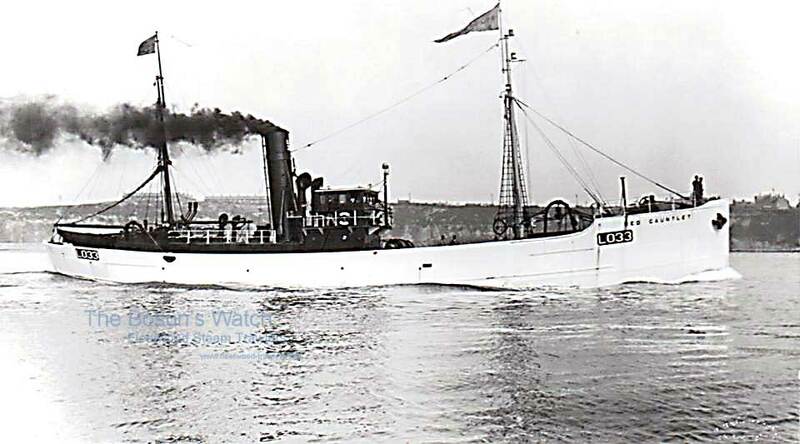 12.8.1958: Sold to Milford Steam Trawling Co Ltd, Milford Haven (Ernest Johnson, manager). 21.8.1958: Registered at Milford (M224). 6.9.1958: Registered at Milford as MILFORD ADMIRAL (M224). 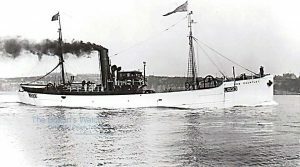 19.10.1961: Milford Steam Trawling Co Ltd, Milford Haven (W. H. Kerr, managers) in liquidation. 12.1961: Sold to BISCO and allocated to Thos. W. Ward Ltd, Sheffield for breaking up. 26.7.1962: Milford registry closed, breaking up completed. 19/05/2012: Page published. 4 revisions since then. 13/01/2017: Removed three disputed images. 19/11/2017: Removed FMHT watermarks from images. 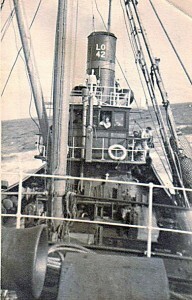 This entry was posted in Steam Trawlers, Steamers (Picture) and tagged Iago on May 19, 2012 by Fred Smith. 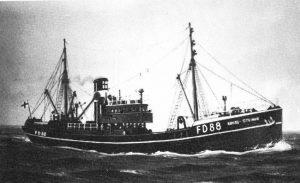 22.12.1949: Launched by John Lewis & Son Ltd, Aberdeen (Yd.No.221) for Iago Steam Trawler Co Ltd, Fleetwood as RED ROSE. 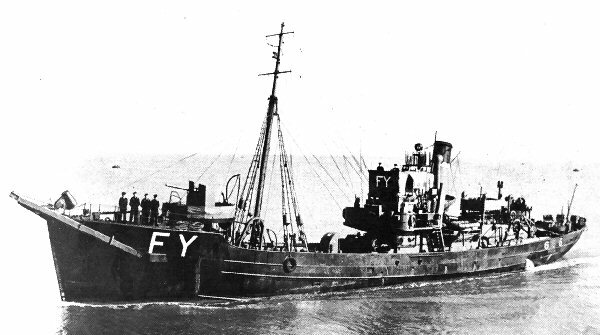 11.4.1950: Trials in Aberdeen Bay and accepted. Registered at London (LO85). Capt. 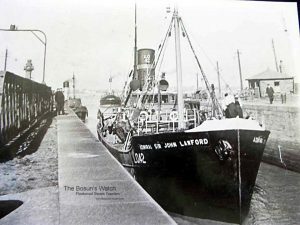 E. D. W. Lawford DSO appointed manager. 26.04.1951: Outwards for fishing grounds grounded on Tiger’s Tail at the entrance to the dock. 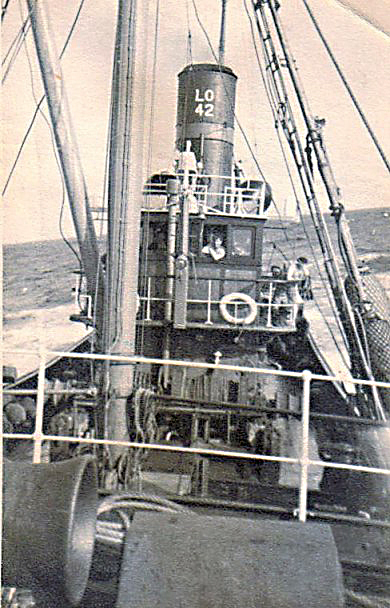 27.04.1951: Refloated and proceeded on voyage. 1952? : Homeward from Icelandic grounds (Sk. Jim McKernan) sighted coaster STRAIDE (326grt/1917) off Crammag Head, Rinns of Galloway, disabled with boiler trouble. Connected and delivered to Larne. 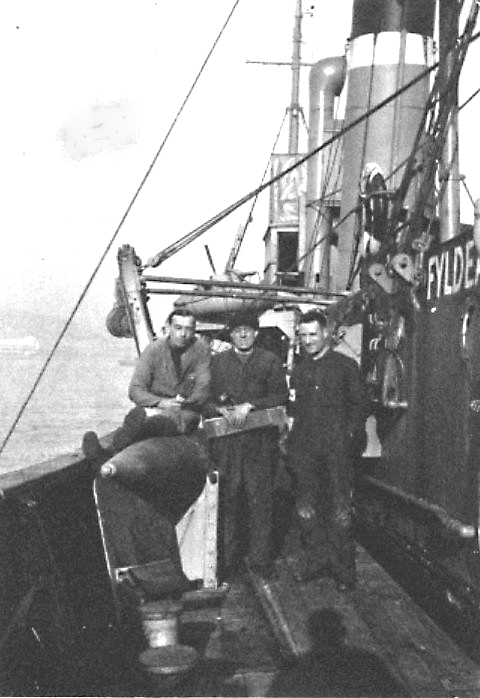 3.5.1954: Last landing at Fleetwood 1,251 boxes/80 baskets grossed £3,040. 5.1954: Sold to Lord Line Ltd, Hull (Thomas W. Boyd, manager). 11.5.1954: Sailed Fleetwood for Iceland on first trip for new owners (Sk. E. Clark). 29.5.1954: At Hull landed 2,559 kits grossed £4,452. 5.1954: Registered at Hull as LORD HOWE (H19). 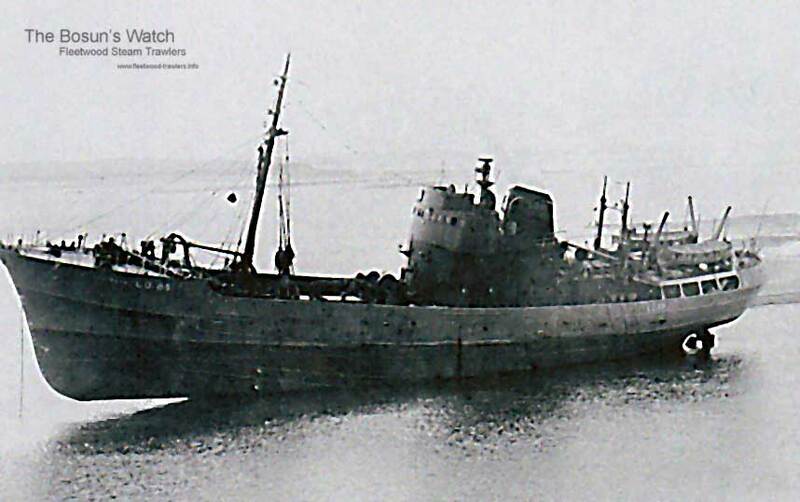 3.7.1954: Sailed Hull for White Sea (Sk. E. Clark). 29.7.1954: At Hull landed 2,306 kits grossed £7,431. 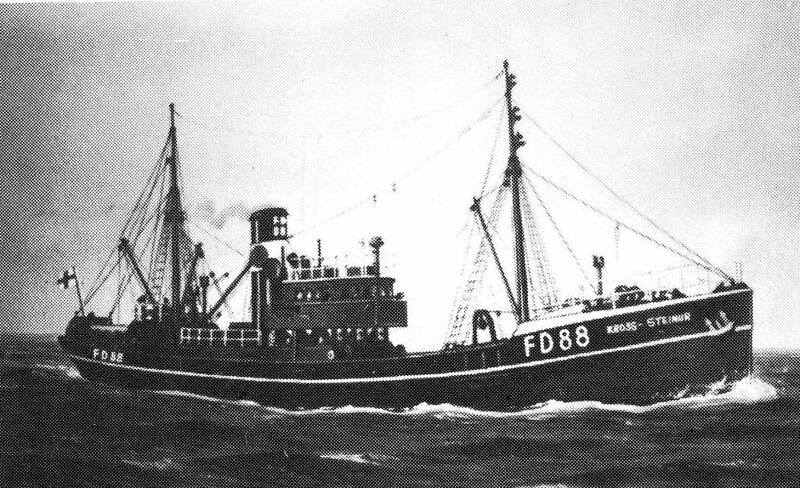 4.1963: Transferred within the Associated Fisheries Group to Northern Trawlers Ltd, Grimsby. 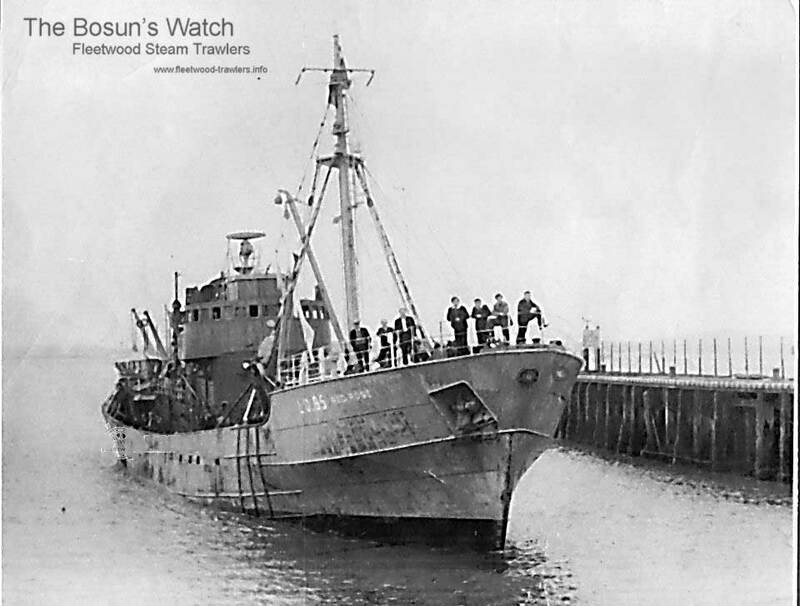 4.1963: Registered at Grimsby (GY82). 5.1971: Sold for breaking up. 30/04/2009: Page published. 8 updates since then. 15/03/2017: Added image and removed FMHT logo from others. This entry was posted in Steam Trawlers, Steamers (Picture) and tagged Iago on April 30, 2009 by Fred Smith. 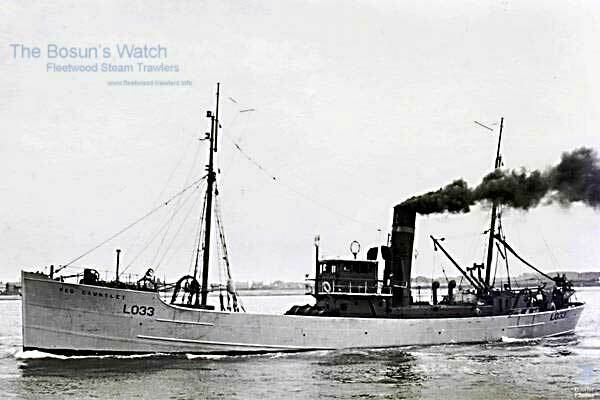 11.6.1930: Launched by Smith’s Dock Co Ltd, Stockton-on-Tees (Yd.No.928) for Iago Steam Trawler Co Ltd, Fleetwood (Edward D. W. Lawford, manager) as RED GAUNTLET. 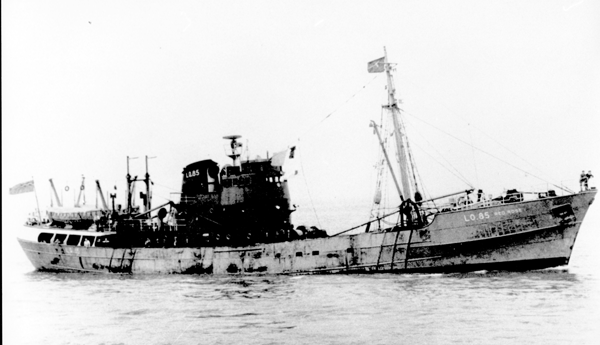 17.7.1930: Registered at London (LO33). 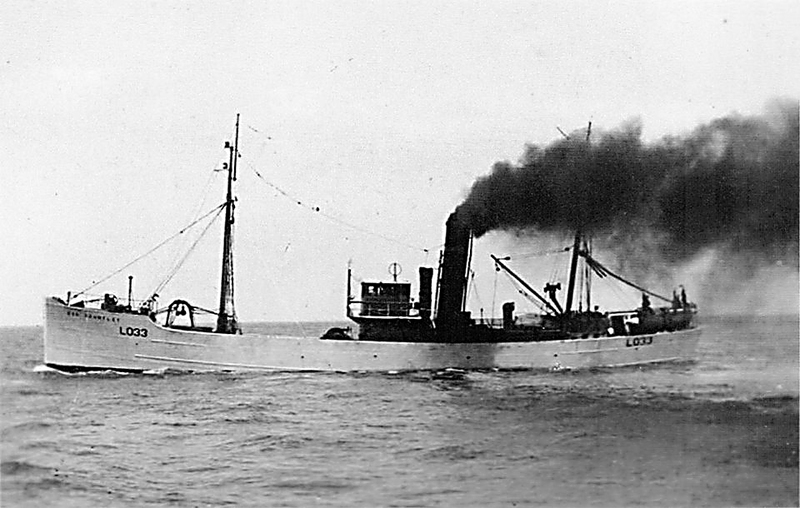 8.1930: Fitted with radio telephone. 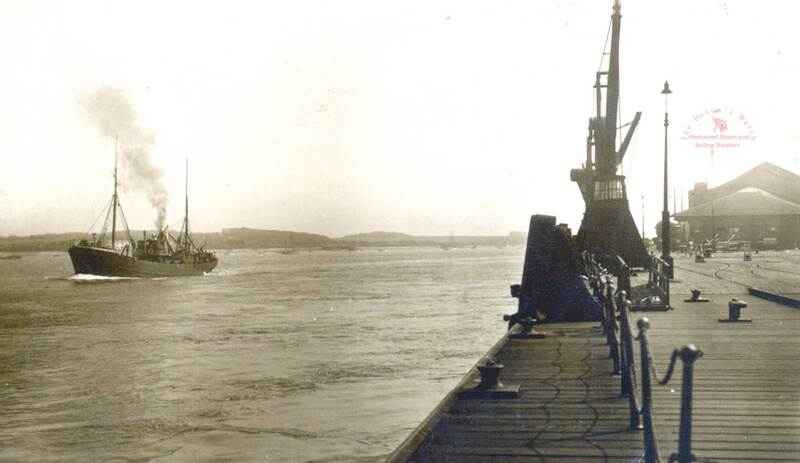 7.3.1932: Inbound Wyre Dock struck dock wall and sustained damage to stem and shell plates. 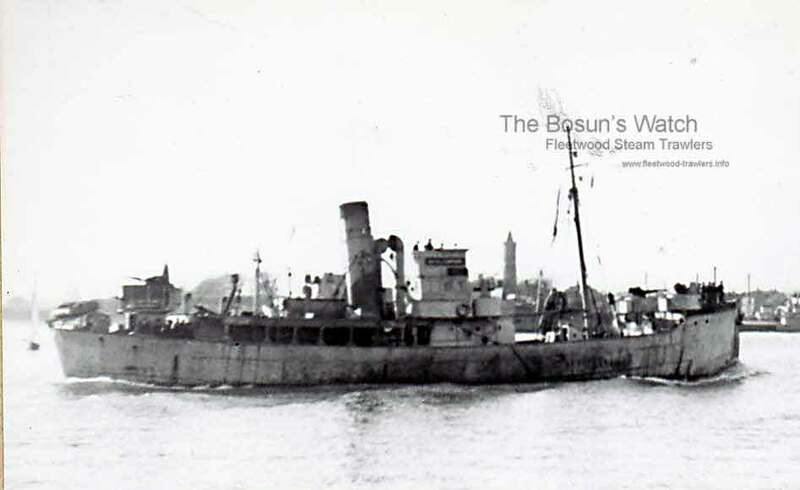 29.8.1939: Requisitioned for war service as a minesweeper (P.No.FY.900)(Hire rate £167.11.10d/month). 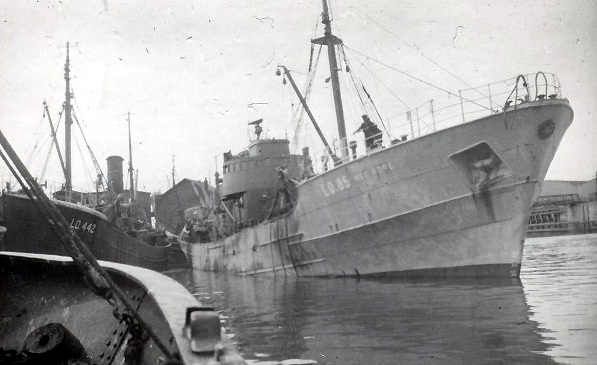 5.8.1943: Lost by E-boat (S-86) attack while sweeping off Felixstowe; crew lost (Ty.Lieut. J. N. Childs RNVR). 6.8.1943: One body picked up by RAF rescue launch. (MPK – Ty.Lieut. 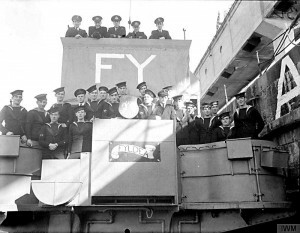 J. N. Childs RNVR – CO; Walter Govis, 2nd Hand; Thomas W. Davies, Thomas R. Godfrey, Edwad H. Judd, Enginemen; John A. H. Heather, Telegraphist; Eric W. Eames, Ldg Cook; Patrick Coleman, John Craig, Joseph Frankist, James P. Lees, Angus Maclean, Roderick McKinnon, Arthur Phillips, seamen; Alexander G. Bunyan, Arthur L. Lang, John Legg, Robert McLean, stokers; James Porteous, steward; Robert J. L. Roberts, Ord. Signalman. 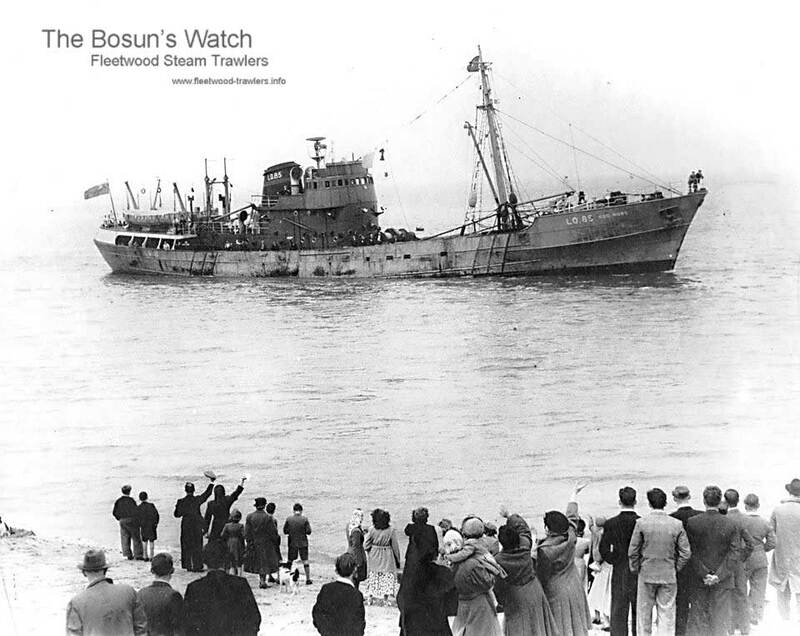 This entry was posted in Lost Vessels, Steam Trawlers, Steamers (Picture), War Losses and tagged Iago, Lost, War Loss on April 30, 2009 by Fred Smith.